In the last two months, 8 more children have been rescued off the streets and now call Chanje Lakay their home. To date, over 125 children have a roof over their head and a warm bed to sleep in. These children are fed three meals a day, receive education, medical care, clean water, clothing, and most importantly, are shown Christ’s love in tangible ways. Your continuous support of these children not only provides for their basic needs, it also allows the opportunity for other children in similar situations to be rescued. In fact, in addition to the 8 new children recently rescued, new children are being rescued frequently; clearly, the need in Haiti is great. Thankfully, through your Child Sponsorship, the need is being met. New children are being sponsored and now have a safe place to call home. These children are the future difference makers of their country. God loves each one of them and has a specific plan for their lives and we have the opportunity to join in and watch the plan unfold. Thank you for your partnership and thank you for making a difference! This past April, a team of a dozen, including medical professionals, had the opportunity to make a new kind of impact in Haiti. Although the Chanje Movement has been building relationships and empowering the people of Haiti for 5 years through a variety of teams and trips, and has seen 100+ team members participate in these experiences, many multiple times, a medical team had yet to go. As a result of a new friendship, Dave Brodsky, founder of the Chanje Movement, along with Rick Braeutigam, invited Dr. “Iggy” Trinh (pictured in the Spotlight to the left) and his team. Within hours of setting foot in Haiti and seeing the dire need, a medical mission to aid Haiti was born. Over the few days the team was there, a clinic was hosted and as word spread, hundreds from the community came to have their medical needs met. 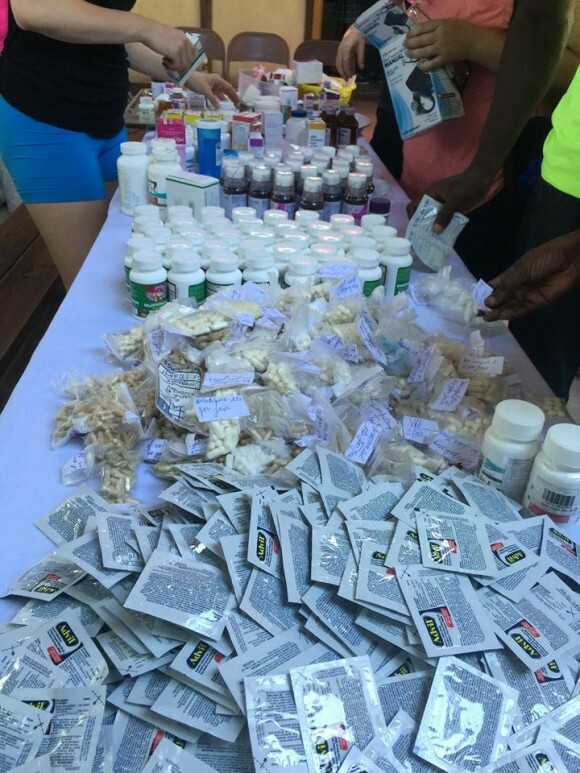 In addition, future partnerships were established and needed medical supplies were provided. As a result of this trip, new medical teams are now setting out to bring a very tangible need to Haiti. In fact, just last month, Dave, Rick, and Iggy headed back to Haiti for another medical trip. We know that this new partnership and element of our work is much needed and we are excited for what the Lord has in store! This August, a team of 25 students and adults, had the opportunity to serve the people of Haiti for a week filled with life-change. The outreach began on August 5th, and as always, the time was spent loving on every child at all three shelters, leading THBS (Total Haitian Bible Sensation), as well as meeting people’s tangible and spiritual needs through public feedings and street evangelism. Together, we see the miraculous take place. With nothing earthly to cling to, the people of Haiti are thirsty for a hope that outlasts their temporary circumstances. Over the years, we have seen Haitians and Americans, young and old, come together to bring the Gospel to those who have never heard. We have seen many come to Christ through outreaches similar to this and this mission was no exception. Team members stepped beyond their comfort zones and led many to Christ. In fact, during THBS nearly 50 youth and children indicated a first time decision to trust Christ. In addition, many people prayed to receive Jesus as Lord and Savior through conversations during food outreaches and street evangelism. Along with these projects, new outreach elements were also added. The team was able to visit a unique community for the elderly, similar to a convalescent home. Team members met people who desperately needed prayer and prayed for miracles. God’s presence was tangible in this place. It was no surprise that God worked in the lives of those the team encountered, as well as the team itself. It was an awesome week of service and growth! In addition to the team trip that took place in August, three team members stayed an additional 10 days after the team returned home. The time was spent at the shelters teaching English, Music, Bible and Art. They met with existing partners, evaluated and assessed the needs of the community, and met tangible needs. Over 500 people received food through several food distributions. Through this extended time, many new strategies and ideas were formed. Most importantly however, the personal relationships with partners and the children living in the shelters were strengthened. Our ministry in Haiti is changing lives; however, there is still much to be done. We have faith that God will open the doors for where He wants us to go next! It’s time to start planning for the Men’s Haiti Outreach and applications are now available! Prayerfully consider how the Lord is calling you to take the next step of faith. These men’s trips are unique and powerful. It was through a men’s team where the heart of starting a children’s shelter and rescuing children off the street was born. It was through a men’s team where the vision to provide loans and begin micro-credit lending began. It is through men and their families that the funds necessary to accomplish the big vision God laid on their hearts has been provided and it is through the men’s team where pastors are trained, businessmen are equipped and leaders are developed.